College students abuse hard drugs, alcohol, and prescription drugs. Very often alcohol and prescription drugs serve as gateways to other more potent drugs. Twenty percent of college going students in America have abused a legally obtainable drug like Adderall and Ritalin at least once in their lives. 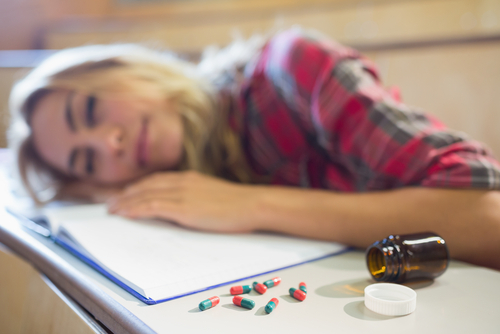 The pressure of college life is cited as the number one reason for taking these drugs. Other reasons that lead to such drug abuse include to feel good, relax in the company of friends, and peer pressure. These drugs are easy to obtain even without a prescription. Students with prescriptions have access to these medications, and they are often pressured into sharing these with addicts. Substance abuse and addiction are increasing at a rapid pace. Many students have no idea about the long-term consequences of such substance abuse. Their inadequacy in handling academic pressures without prescription medication forces them to focus only on the perceived short-term benefits of such drugs. Students may back themselves to not fall prey to the addictive properties of such drugs, but very often they end up physically dependent and finally addicted to stimulants. Consuming medication prescribed for someone else and consuming it in a way not prescribed can lead to problems. Such misuse raises the risk of heart attacks, damage to organs, hypertension, tachycardia, difficulty in respiration, brain damage, overdose, and death. The abuse of prescription stimulants opens the doors to other forms of substance abuse. Binge drinking is more common with those who take such medication. From here, the progress to marijuana, meth, coke, and heroin is a very distinct possibility. Once tolerance to prescription drugs happens, the students either increase the dose or move on to more powerful drugs. Counseling in college and at home can prevent this problem. Impressionable youngsters must be made aware of the heavy costs attached with such drug abuse. Counseling and outreach programs are a big help. Colleges must have a strictly implemented policy on the abuse of prescription medicine. Early detection of the issue is possible if one knows the signs to watch out for. Consumption of large doses of prescription drugs without supervision, aggressive behavior, bloodshot eyes, changes in behavior, etc are signals that a student is abusing such drugs. Colleges must encourage students to learn time management. On their part, students should be careful about the kind of company they keep. They must stay away from those who have taken to prescription drugs for coping with deadlines. Withdrawal from prescription drugs is unpleasant, and students who undergo rehab may actually lose out on a precious year. Any kind of addictive behavior, if it shows up against your record, is going to complicate things later in life; jobs, apartments, loans…all these things become that much more difficult to obtain.